When we were in Oxford with Timothy’s new bag last year, we realised that we had forgotten to take his metal ‘S’ hook with us. Not having the hook limits the hanging opportunities. We tried to buy one, but where do you get an S-hook in a city centre? Well, a butcher uses them. Turns out they sell them too – 50p each at the indoor market in Oxford. REALLY strong too – with sharp points. 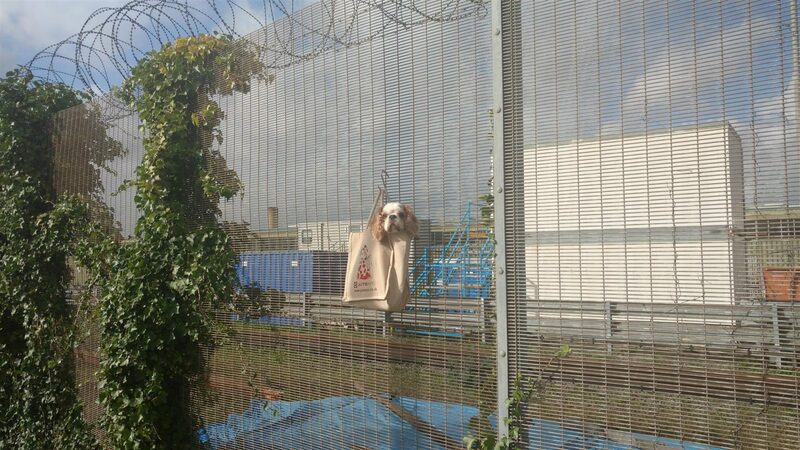 Here is Timothy using his butcher’s S-hook to hang from a fine weldmesh fence by a north London train depot. Without the hook, there’d be no way he could’ve hung here. Thanks, butcher!